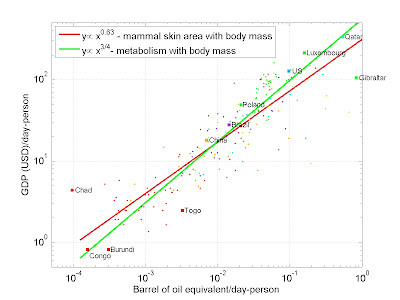 The two solid lines are the power law scalings of metabolism in mammals from a tiny shrew to a huge whale. 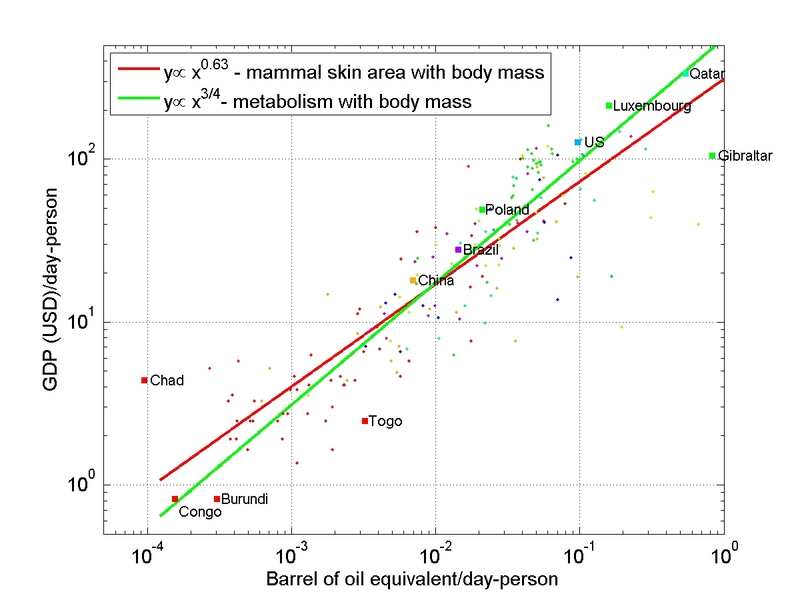 For example, the skin area of a mammal scales with its body mass to the power 0.63 (the red line). 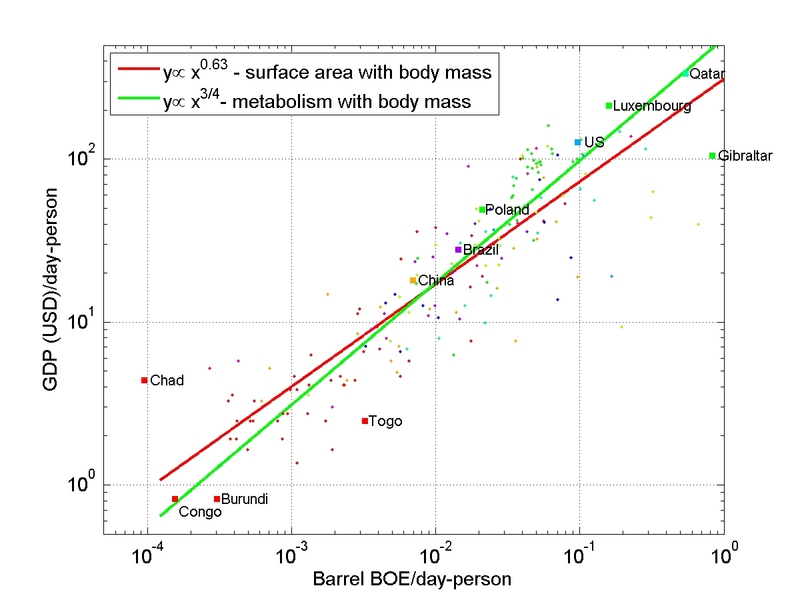 The oxygen intake, or the rate of metabolism in a mammal, scales with its body mass to the power of 3/4=0.75 (the green line). As you can see, the throughput rate of the hydrocarbon energy per person is equivalent to body mass of a mammal, and the societal metabolism (GDP/person-day) is equivalent to the rate of oxygen intake in mammals. This finding should not be surprising. A non-equilibrium dissipative structure, such as a developed society, organizes and feeds its complex institutions with a flux of energy, much of which comes from hydrocarbons. What surprises me is that the scaling exponents are almost the same for all societies on the Earth and for all mammals. The metabolism-like scaling of societal complexity means that "bigger" or more complex societies necessarily require more energy throughput. Conversely, a smaller energy throughput necessarily leads to a simplification of the society. So don't worry, the U.S. will become simpler soon, and so will our health care system, as well as funding for education and research. A corollary to the plot above is an observation that a steady-state society, whose material economy does not grow, still requires a certain level of energy flow through it to maintain its energy-conserving structures. More importantly, even purely spiritual institutions and organizations will require their own energy throughput to remain active. Unless everything is recycled perfectly and only heat is given off, chemical waste discharges into the environment in a steady-state economy will continue to injure the environmental services for some time. Thus, remediation of active chemicals will require dedicated energy throughputs for some time after their discharge, at a cost of diminishing energy allocations elsewhere. Is, then, a steady-state economy possible? Or does the second law of thermodynamics prevent its existence through a gradual creation of entropy, and an ever-increasing diversion of energy to remediate the effects of this entropy? Next, I will plot where the USA would be on this plot if it only operated on biomass, biofuels, wind turbines, and solar photovoltaics. Fascinating. It's truly a crime that you only have 6 followers, but sadly indicative of the general state of humanity.